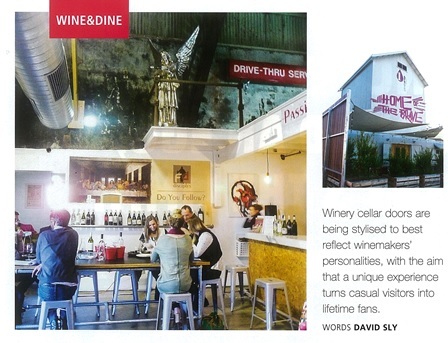 This article was featured in the latest edition of SA Life Magazine where John Retsas talks about the wine, food and uniqueness of First Drop’s ‘Home of The Brave’. When First Drop Wines formed a decade ago, it cleverly sat among the first wave of virtual wineries – putting its resources into grapes and wines rather than buildings and infrastructure. Now, the team of winemaker Matt Gant and marketer John Restas has a physical home in the Barossa – the appropriately named First Drop Wine and Tapas Room, which is characteristically out of the ordinary. “We never expected to have a cellar door, but the landlord of the place we rent to make our wines was keen for us to have a presence – so we thought about what a First Drop showroom should be. How should we present ourselves? Fun is a big part of our image, but our challenge was how to put this across,” explains John. This has been an essential First Drop trait since its inception – a brand that markets its big range of 26 wines with garish cartoon labels and amusing marquee titles: Mother’s Milk shiraz and Mother’s Ruin cabernet sauvignon, Lush rosé, The Matador Grenache, the very naughty Minchia montepulciano, and the racy Does Your Dog Bite single vineyard shiraz. The wine and tapas room is equally irreverent and boisterous, with loud graphics and banners, a scattered squad of inflatable emperor penguins, and a satirical mural of Da Vinci’s The Last Supper with Matt Gant as the central figure asking who else will become a First Drop disciple. Yes, they risk being offensive, but pill off their irreverent humour with affable, roguish charm. It helps that experienced hospitality front man Ivan Pachnik is running the cellar door, easily guiding tasters through the big range of wines. Visitors will also find a few rarities occasionally open for tasting – from the Fat of the Land series of single vineyard shiraz, through to back vintages that show how the wines are maturing.